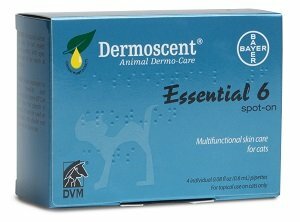 Dermoscent Essential 6 Spot-On is a topical skin care pet medication for dogs and cats. Dermoscent topical applications contain Omega-3 and Omega-6 fatty acids, essential oils, and vitamin E which all help replenish and restore your pet's skin and coat. Dermoscent Essential Mousse for Cats formulated with essential oils, Omega-3 and 6 fatty acids and pumpkin seed extract, Dermoscent Essential Mousse Rinse-free Cleansing Care for Cats cleans and freshens your cat?s skin and coat. This soap-free mousse supports hair coat shine, hydration and the natural barrier function of the skin. Since the formula is no-rinse, it offers a convenient management option to quickly clean your cat's coat between baths or when bathing is impractical. Formulated with pumpkin seed extract, essential oils and essential fatty acids from plants, it untangles the coat and increases fur shine. No-rinse and soap-free, it's the easy and natural way to clean you cat's coats. It deodorizes and efficiently eliminates dirt trapper in the coat without the need to rinse off after use, simply towel dry. Supports hair coat shine, hydration and the natural barrier function of the skin. It can also be used on small animals and is perfect for pets with sensitive skin. The practical solution for cleaning rowdy animals or those that dislike water. Great in keeping incontinent pets or those who are recovering from surgery hygienic. Convenient cleansing option when bathing is impractical or when you need to preform a quick touch up. Ideal for animals living in apartments where lack of space can inhibit frequent cleansing. Dermoscent's Essential 6 this synergistic blend of essential oils helps bring balance to the natural ecosystem of your cat?s skin. Omegas 3 and 6 work together with 10 essential plant oils for a supplement designed to help with dry, greasy, flaky and oily skin. Plus, this oil even helps to reduce bad odors, ensuring your feline friend is obtaining her best coat possible. Heal dry, flaky, oily or greasy skin with this 100% natural plant-based treatment. Intended to remedy kerato-seborrheic disorders and atopic dermatitis. Enriched with fatty acids to moisturize, deodorize and reduce excessive shedding. Strengthens the dermal barrier for a healthier skin and coat. Reinforces the natural defenses against bacteria, yeast, fungi, and external parasites. 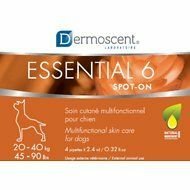 Dermoscent's Essential 6 is a multifunction skin care solution for regular use on all skin and hair types of pets. It is fragrance free, easy to use, and safe for even the most sensitive pets. Dermoscent Spot-On is formulated with 100% natural active ingredients. This carefully selected group of ingredients include: essential oils of rosemary, lavender, melaleuca, oregano, grain oils of hemp and neem, smoothing and purifying agents, vitamin E, bio-diffusing vector. With the synergetic action of these ingredients, Essential 6 Spot-On has a plethora of benefits for your pet's skin. Essential 6 helps restore hydrolipidic film of animal skin and maintains its optimal hydration, favors natural cutaneous ecosystem balance and reinforces skin defenses, purifies animal skin and helps prevent irritations, deodorizes but respects the animal's own smell, helps diminish hair loss and sustaining hair growth and also has an antioxidant effect. Heal dry, flaky, oily or greasy skin with this 100% natural plant-based treatment. Intended to remedy kerato-seborrheic disorders and atopic dermatitis. Enriched with fatty acids to moisturize, deodorize and reduce excessive shedding. Strengthens the dermal barrier for a healthier skin and coat. Reinforces the natural defenses against bacteria, yeast, fungi, and external parasites. Dermoscent Essential Mousse For Dogs is a rinse-free topical spray that works to condition and maintain your pet's coat. This solution includes both Omega 3 and Omega 6 essential fatty acids that work to promote the skin and coat's natural protective barriers. These fatty acids are combined with other nutrients in a soap-free base to prevent causing unnecessary wear on your pet's skin and coat. Dermoscent® Essential Mousse For Dogs supports a lustrous, shiny coat and keeps the fur strong and hydrated. This bottle includes 5 fluid ounces of the solution to keep your dog's coat in top shape. Don't let your pooch's fur become brittle and matted, order this easy-to-use conditioning mousse today! Leave-on rinse cleanses and deodorizes your dog?s skin. Effectively removes dirt and dandruff for a cleaner coat. Moisturizes and soothes skin, providing relief from irritations. Restores the hydrolipidic film for cutaneous comfort. Ideal for pups with even the most sensitive of skin types. Dermoscent Bio Balm contains the moisture necessary to treat hyperkeratosis of the nose, paw cracks, lesions, and even prevent infections. Made without mineral oil or petroleum-based ingredients, this balm can be applied to cracked noses, paw pads, calloused pressure points and hot spots for relief. The balm is waterproof so it continues to work in any weather or location on the body. Topical balm is rapidly absorbed to provide your dog with relief against skin damage. Treats hyperkeratosis of the nose, paw cracks, lesions, and works to prevent infections. Ideal for cracked noses, paw pads, calloused pressure points and hot spots. 100% natural recipe is made without mineral oil or petroleum-based ingredients. Formulated for dogs, this waterproof balm will provide your pooch with comfort against various skin problems. 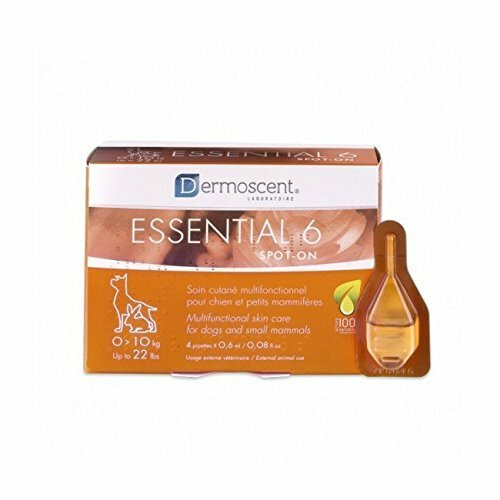 Dermoscent Essential 6 Dermoscent's Essential 6 is a multifunction skin care solution for regular use on all skin and hair types of pets. It is fragrance free, easy to use, and safe for even the most sensitive pets. Ingredients Dermoscent SpotOn is formulated with 100 natural active ingredients. This carefully selected group of ingredients include: essential oils of rosemary, lavender, melaleuca, oregano, grain oils of hemp and neem, smoothing and purifying agents, vitamin E, biodiffusing vector. Benefits With the synergetic action of these ingredients, Essential 6 SpotOn has a plethora of benefits for your pet's skin. Essential 6 helps restore hydrolipidic film of animal skin and maintains its optimal hydration, favors natural cutaneous ecosystem balance and reinforces skin defenses, purifies animal skin and helps prevent irritations, deodorizes but respects the animal's own smell, helps diminish hair loss and sustaining hair growth and also has an antioxidant effect. 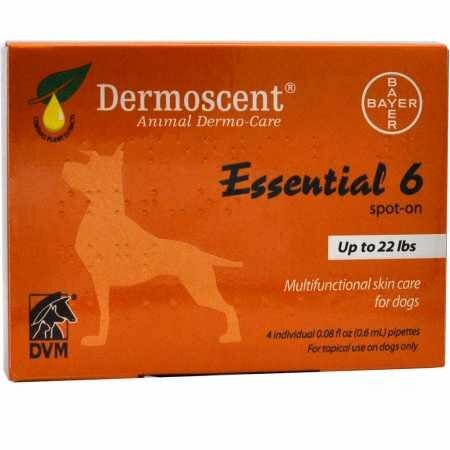 Dermoscent Essential 6 Spot on skin care for dogs All Natural Easy to apply Restores hydrolipidic film and maintains optimum hydration More Info Skin Coat Supplements Keep your pet's skin and coat looking its finest. Shampoos and Sprays Browse a wide variety of shampoos and conditioners. Top Skin and Coat Supplements Take a look at the top skin and coat supplements. Skin Care Just like your own skin, your pet's skin has a very important job to do. Dermoscent Essential 6 Spot-on Skin Care for Large and Extra Large Dogs helps with normal hair coat turnover, reducing malodor while supporting coat luster and manageability. Formulated with essential oils, Dermoscent supports the skin barrier to promote better hydration. The formulation contains naturally-derived ingredients and is pleasantly scented without any added fragrance. Quick and easy to use, Essential 6 Spot-on may help to decrease bathing frequency and provides a source of essential fatty acids Omega-3 and 6 directly on your dog’s skin. This innovative dermo-cosmetic spot-on provides a multi-functional approach to animal skin care. It contains plant-based essential fatty acids (including linoleic acid), antioxidants (Vitamin E), and essential oils that moisturize, balance skin, reduce scales and dandruff as well as provide a lasting deodorizing effect. Key to the products benefits is the restoration of the hydrolipidic barrier of the skin, thus reinforcing natural defenses against bacteria, yeast, fungi and external parasites. Essential 6 is a patented formulation of 100% natural active ingredients, including 10 essential oils and grain oils of hemp and neem. Hypoallergenic and fragrance free. Directions & DosageBegin initial treatment with the application of 1 pipette once weekly for 8 weeks. After the 8 weeks, apply 1 pipette every two weeks to maintain improved skin and coat condition. Part the hair coat at base of neck, between shoulder blades to expose skin and apply contents of pipette directly to skin at one or two spots. Improvement in skin or coat condition is most often seen within the first 3-4 weeks. Do not shampoo 48 hours before or after using Essential 6 spot-on. Do not rub in. Leave on area to diffuse naturally. For long-haired dogs and cats, it is recommended to gently brush out the application site 24 hours after the application to remove any residue remaining on hair.IngredientsBio-diffusing agent, Hemp seed oil (0% THC), gelling agent, Melia Azadirachta (Neem) seed oil, Rosmarinus Officials (Rosemary) leaf oil, Cinnamomum Camphora (Camphor) leaf oil, Mentha Piperita (Peppermint) oil, Cedars Atlantic bark oil, Curcuma long root oil, Oirganum Compactum oil, Gaultheria Procumbens (Winter-Green) leaf oil, Tocopheryl Acetate, Bisabolol.